Being a working mom and still keeping up on a home is anything but easy. Not only are many of your daily hours spent working, but the last thing I feel like doing as a working mom is doing more work when my work day gets done. Maybe you can relate? But, even with help from family members, I find that having a plan for what to clean each day and how to break bigger cleaning tasks down throughout the week makes it so much easier. 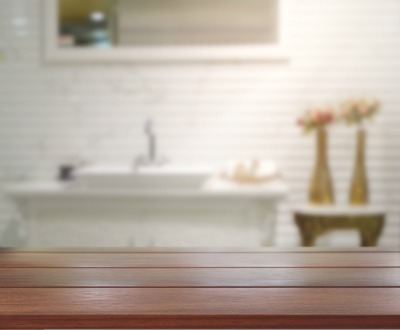 If you have an hour before work, an hour after work, and an hour before you shut down for the evening each day, you will have an excellent handle on a cleaning schedule that will help you have a cleaner and more organized home every day. Before we go any further, be sure to enter your email address below to get instant access to a printable cleaning calendar that will tell you exactly what to clean in March (or any month). Enter your email to grab your calendar & get cleaning! Success! 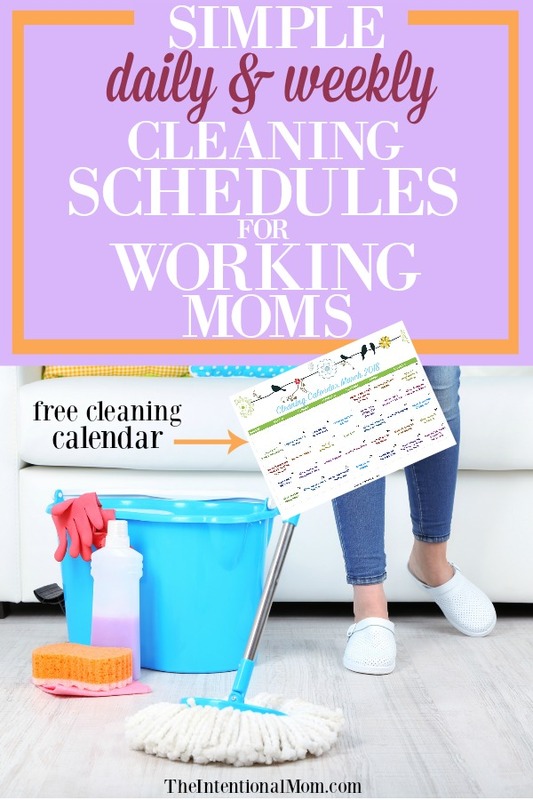 Now check your email to find your free printable cleaning calendar! The following list assumes that your house isn’t completely overrun, or that there isn’t a ton of clutter standing in your way of getting these things done. If a bunch of clutter is standing in your way, I would suggest putting the clutter aside in a box or bin to take care of at a later time. 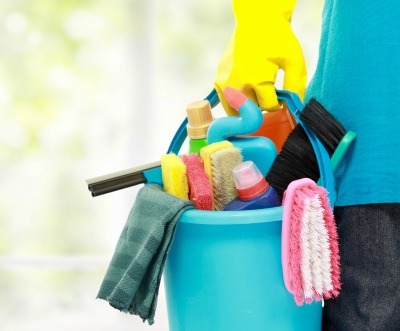 For the purpose of sticking to a cleaning schedule as a working mom, focus on cleaning right now, and cleaning only. It can be so easy to get distracted from the task we set out to do because we notice something else that could or maybe even should be done in our mind. So, we tend to that thing that came up and never get back to the original task. But, it’s generally most effective to focus and accomplish the original task while making a plan to accomplish whatever it is that may come up in the midst of it. Before you check out the tasks below, let me explain what the 30 minute speed clean is. If you want to read about this in greater detail, you can read about the 30 minute speed clean HERE. But in a nutshell, the 30 minute speed clean is dividing up your home into three zones. Then, you spend 10 minutes in each of the three zones, working as quickly as possible on just cleaning up in that area. It’s a declutter, put things away, or remove things that don’t belong cleaning frenzy. With the tasks listed below, you will see a task followed by a number. That number is the estimated number of minutes that particular task should take you. Ready to get started? Let’s get cleaning! Let’s talk about cleaning tips & a weekly cleaning schedule. This schedule is perfect for working moms, work at home moms, and even stay at home moms. Some prefer to do all the extra cleaning tasks on the weekend. But, if you find yourself even too busy on the weekend to take on the bulk of the cleaning, having a cleaning task or two scheduled each day of the week will allow you get all the cleaning done each week, a little at a time. Each of the following tasks is strategically designed to take an hour each day. So, even if you have only three days a week to take on these cleaning tasks, you will have an easy way to combine tasks in a way that makes sense, knowing how long each task should take you. If you only have time to clean on Monday, Wednesday, Friday, and Saturday, you can grab tasks to combine from any of the days listed below, knowing that each day’s tasks should take you about an hour. So, here is a schedule that is designed to cover the major areas in most homes each week. In fact, whether you are a working outside of the home mom, a working inside the home mom, or just someone looking for a game plan to having a clean home, this weekly schedule is just what you need to focus less on what to do and more on the actual cleaning itself. Want a copy of this cleaning schedule to print out? No worries! Enter your email address and have one sent right to your inbox – it’s pretty too! Success! Now check your email to grab your free download and get some other cool stuff! 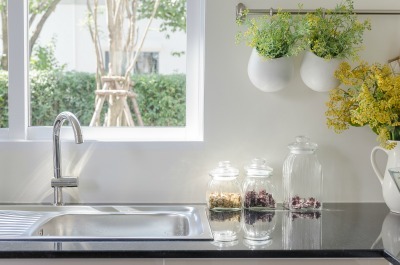 Having a clean and more organized home really is possible. It’s just a matter of having a cleaning schedule a few cleaning tips and tricks, and some organization ideas to help you get it done. That way, you can spend less time cleaning and more time doing what you really want to do each day.